Every fan of symphonic metal knows that Nightwish has had some very prominent line-up changes. They started out with operatic powerhouse Tarja Turunen, but Anette Olzon took her place. Much drama tainted the fandom with this switch (which I discuss a bit in this post), for Anette's voice is so different than Tarja's. Anette has more of a rock/pop sound, and many complained that she wasn't the true face of Nightwish. Personally, I loved the two albums Anette made with Nightwish (Dark Passion Play and Imaginaerum) but I've often been the odd one out in this situation. However, even though I liked Nightwish with both Tarja and Anette, I never felt that either of them were the perfect fit for the music per se, with certain exceptions. Both have made amazing records with Nightwish, and both have made very different records with Nightwish. I love their sound with Tarja, and I love their sound with Anette. The only problem is, we'd never have both at the same time. 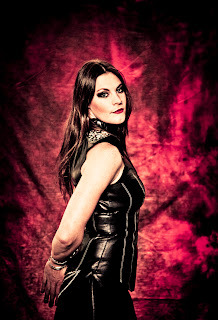 Recently, Anette left the band while they were on tour, and Floor Jansen of After Forever and ReVamp filled in. I'd never been a Floor fan simply because I'd never been a fan of any of the bands she's been in, I knew her voice well enough to know that she'd be able to bring older Tarja songs to the setlist, and all the tarja fans that loathed Anette would love Floor. I was indifferent. I tried looking up videos of live sets with Floor, but the crowds were oftentimes too loud for me to properly judge. Yet, I did. Then, I saw an HQ video of Floor singing "Ghost Love Score" with the band in Buenos Aires. It's a long, classic Nightwish tune originally performed by Tarja on the album Once. I was sort of impressed, sort of indifferent as I heard the first half. It was good, no doubt about it. But then when things got epic during the second half, I kept becoming more and more excited. I saw how great she is with this band, a subconscious process I began to feel effects of amid my happiness. Then I heard her new ending of the song; I heard the note. The note. I cried. This band I've always loved despite never finding either singer to necessarily be the perfect fit... Floor is the perfect fit. She didn't just fit; she helped enhance. Her ability to switch up vocal styles as needed made her unique as a singer already, but now that she's been with a band that has music that appeals to my personal taste, I can now truly appreciate her. For a while, this was all very bittersweet. Though Nightwish finally found a singer that I consider perfect for the music, there was a possibility that she'd only stay for that tour and not an album. But, in this press release found on the official Nightwish site, it has been confirmed that she is the new lead singer of Nightwish. I'm so excited and relieved to hear that she's staying. When I found out, I couldn't stop fangirling! She's a great vocalist and frontwoman for Nightwish, and the rest of the band seemed to be so happy with her performing alongside them. I can't wait to hear how the band will evolve for her voice on the next album, and I really want to see them live next time. Towards the end of the year, their live DVD with Floor at the Wacken Open Air festival, Showtime, Storytime, will be released. "Ghost Love Score" is on the set, and the very performance in Buenos Aires that made me a Floor fan will be a bonus feature. It's as if they knew I'd want it. Until we can all get our hands on this DVD, I assume there will be much celebration among the fanbase. In all honesty, I haven't heard a single negative comment about Floor. For the first time since 2007, I think nearly all Nightwish fans will be happy. great article! I could have written it myself as it's exactly hat I think of the whole Nightwish story ... I've heard the wacken concert and Ghost loved score gave me shivers ... amazing voice on this one! Floor is the missing piece since 2007 ... Tarja was so awesome, not replacable in fact, but in another style I think Floor is the best choice they could have make ... finaly !!!!!!!! !